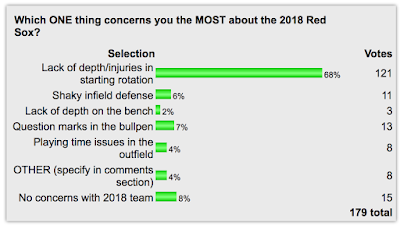 Continued voting in our latest FenwayNation Poll shows that almost seven readers in ten (68%) are most concerned with depth and injury issues related to the Red Sox starting rotation. 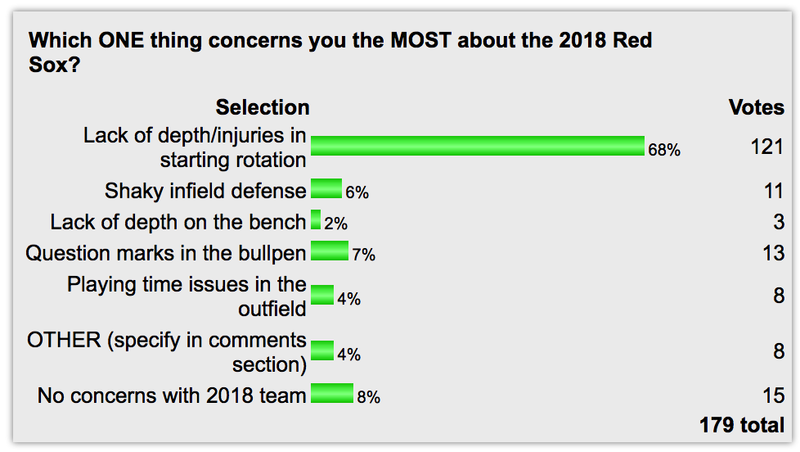 As the chart shows, no other category in the poll is even remotely close to the rotation response—with second place comprised of 8% who actually say they have no concerns about the 2018 team. 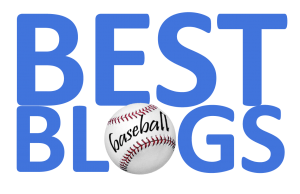 Next, at 7% are question marks in the bullpen, while 6% are most concerned with a shaky infield defense. Playing time issues in the OF collect 4% of responses—as do "other responses" not listed. Just 2% see lack of depth on the bench as the main area of concern. You can still vote HERE.